Up until two days ago we were decrying the fact that the world is silent about Syria (it wasn’t “silent” per say, it was pumping weapons in from day one pretty much), and now that there are strong indications that the world is going to intervene, we decry the fact that the world is going to intervene? How does that work? I’m not asking this just to be a pain, I really don’t understand. I’m as deathly scared of the results of intervention as can be. I know there’s a good chance that disaster will ensue, although to be fair disaster has been the case for over two years now. I do want to ask however what the alternative is? Do we just allow things to “take their course” in Syria? If we do, then we should also be honest with ourselves as to what that course has been – a course of two warring factions, a murderous government and an ambiguous, unclear, and definitely uneven opposition, with the majority of the Syrian people smack in the middle of it all, paying the ultimate price. I think Charles Glass was right when he said over a year ago that a large amount of the blame for the situation in Syria rests on the shoulders of external players – Russia, China, Turkey, a few “Western” countries, some of the Arab countries – all those who just couldn’t stop pumping in those arms to the regime and the rebels. We killed any chance there might have been for a civilian solution back then. I also sympathize with all those crying “what about Iraq?” – but while the Iraqi invasion was based on lies, I don’t think this is the case. I have no blind faith in the benevolence of “the West”, far from it. But despite all that, we are here now and Syria’s people are still being slaughtered. So my questions remain – what should we do? What should the world do? Are we actually ok with sitting by idly, although that’s what we’ve been fighting against all along? 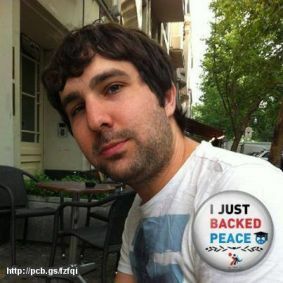 Posted on September 2, 2013 April 10, 2016 by rebeccabrindzaPosted in English, UncategorizedTagged israel, NimrodBenZeev, peace, syria, yalayoungleaders.